GOOOAAALLL!!! This stocking is for that soccer fanatic. it has an adorable snowman with a soccer that says, "Get a Kick out of Christmas!" 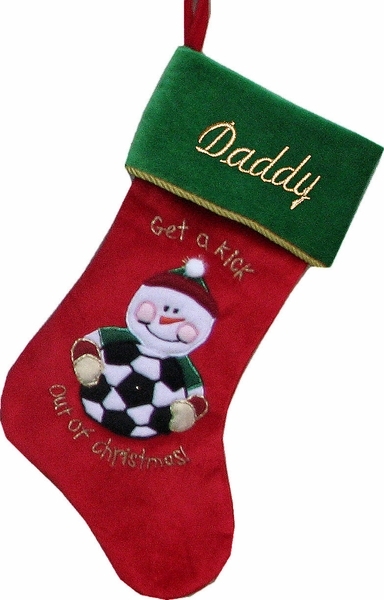 Make sure that if you have a little soccer player you get them this stocking, they will love it for the rest of their life! Measured The stocking is plenty big, about 18" diagonally and 7" wide. Materials: The stocking is made from red and green velvet, it's applique baseball snowman is done in a metallic gold and green embroidery design. The cuff is trimmed with an elegant gold rope. Lining: YES. This stocking is lined inside with red polyester satin. Names can be personalized on the cuff of this Christmas stocking with embroidery thread to compliment the colors of the stocking and the design on the stocking. Choice of fonts: Embroidery Script Font, Embroidery Hand Font or Embroidery Block Font.